Alex Morozov is the director of European equity research for Morningstar. Now that the House of Commons has rejected the Brexit deal UK Prime Minister Theresa May had negotiated with the European Union, it's a good time to revisit our equity analysts take on what the impact of a disorderly exit would be. Betting on the outcome of political debates isn’t our forte, and the upcoming U.K. House of Commons vote that could determine the direction of the world’s fifth-largest economy for the foreseeable future is no exception. As bottom-up, fundamental, long-term-focused analysts, however, we do want to ensure that our industry analyses and models adequately account for the macroeconomic and political risks. In this research, we use a worst-case scenario of a disorderly no-deal Brexit to stress-test models for our companies with the greatest exposure to the U.K. economy and Britain’s exit from the European Union. While we identify a number of companies that could face long-term adverse developments following a no-deal Brexit, namely in the automotive space, we also see most disruptions as short term in nature and thus unlikely to materially alter our long-term views. We believe we adequately account for the heightened risk via our fair value uncertainty ratings, and we see a number of investment opportunities with the market getting jittery as we get closer to Brexit Day. To paraphrase Mark Twain, the more you explain Brexit, the more we don’t understand it. However, we are just a few days away from the “meaningful vote” motion in the U.K. House of Commons, which will set in motion any number of events, with the ultimate outcome particularly challenging to predict. Our goal isn’t to speculate on the direction of political events or generate macro forecasts for each potential Brexit scenario. However, we do need to give investors some understanding of risks that could have direct and material implications for their holdings. The area where we believe we can add particular value, given our methodology that focuses on long-term cash flow generation and economic moats, is in providing an assessment of the long-term implications of disruptive events for competitive positioning of individual businesses and their future earnings power. Stress-testing our models to account for worst-possible scenarios also informs us of the margin of safety we’d recommend before investing. We have attempted to handicap the longer-term implications of the highly unlikely but very damaging disorderly no-deal Brexit on the industries that have the most exposure to the U.K. economy and are directly affected by whatever-they-may-be future trade policies between the EU and the United Kingdom. The disorderly Brexit modeling effectively assumes the EU and U.K. relationship deteriorates completely and the U.K. exits without any trade agreement in place, causing potentially severe short-term reverberations and a deeper, more prolonged economic malaise. We assess both the direct first-order effect of the U.K. having no preferential trade agreements with the EU and thus being subjected to World Trade Organization tariffs and the second-order effect of a likely downturn in the U.K.’s economic growth, acceleration of CPI inflation, increase in the unemployment rate, and sterling devaluation. While a severe and prolonged downturn in the U.K. economy will have material implications for companies with significant revenue tied to the U.K. market, we should at the very least be cognizant of a potential contagion effect of a global recession, even if most forecasts we have seen do not consider that to be a meaningful risk. For now, we assume that in the disorderly worst-case scenario, the economic downturn will be primarily confined within the U.K. but have a modest effect on the remainder of the EU. Morningstar’s global equity research coverage tends to skew toward larger-capitalization stocks, which also tend to be multinational companies. With the exception of a few U.K.-focused industries (food retail and telecom, for example), companies we cover have global operations, mitigating whatever impact would be felt from an isolated-to-the-U.K. economic downturn. Not surprisingly, smaller U.K.-centric companies that compose much of the FTSE 250 are likely to feel the brunt of the downturn, which has depressed their performance relative to their larger FTSE 100 peers, particularly since the news of an impending vote rejection of Prime Minister Theresa May’s proposal started circulating. Housing, construction, and retail companies in particular are more likely to be affected in the recessionary environment. 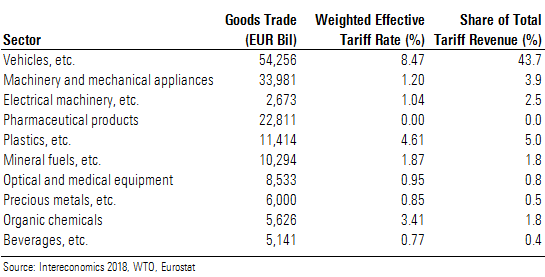 Industries most exposed to tariffs and their share in the total tariff-affected EU27-U.K. trade are listed in the accompanying table. The automotive sector stands out as the one most affected, and, not surprisingly, the entire industry fares the worst in our universe under our disorderly scenario. Tariffs to be levied on the automotive sector account for 43.7% of EUR 10.5 billion in total tariff revenue. It is important to stress that while companies across many industries will be affected to a varying degree by Brexit, as investors, we are mainly preoccupied with the question of how much of this is already priced in. Even in industries with a meaningful level of exposure to Brexit, we see opportunities. The U.K. automotive industry is highly integrated with the EU, including vehicle production and parts manufacturing. Auto industry trade ties are especially strong between the U.K. and Germany. Germany is the top destination for U.K. vehicle and parts exports. Just slightly behind the United States, the U.K. is the number-two destination for German vehicle and parts exports. U.K. automotive trade with France, Italy, and Spain is also very substantial. If a trade rule tariff were just on the imported vehicles, U.K. consumers could switch to competing products not subject to EU tariffs. However, EU tariffs on vehicle parts presents a problem, potentially causing price increases for U.K.-built vehicles too. The reason that automakers consider U.K. factory closures as a strategic option is not only because of export volume to the EU; it’s also because their supply chains are integrated with the EU. Manufacturers are concerned about the impact on demand that price hikes would have but also delays in the supply chain at ports of entry, as well as the working capital investment that will be required to offset the inventory trapped at ports. We think that in a hard Brexit scenario, U.K. and EU light-vehicle demand would be affected by price increases on both sides, with a risk of greater price hikes on all light vehicles sold in the U.K., regardless of domestic or EU origin. Using our hard Brexit light-vehicle demand forecast in our discounted cash flow models results in an average 14% reduction in auto sector fair value estimates. However, in the current macro environment, the market has overly discounted several stocks in our coverage. Most notably, BMW (BMWYY) retains a 4-star rating assuming a hard Brexit. This narrow-moat automaker has a current market valuation representing a 31% discount to our hard Brexit EUR 105 fair value estimate. By far the greatest value destruction for banks occurs when banks are forced, through solvency and/or liquidity concerns, to raise capital. Typically, this is also when valuations are at their lowest, increasing the pain for shareholders. Banks are particularly sensitive to unexpected shocks--like the U.K. tumbling out of the EU without any trade deals in place--which can often spark a loss of confidence and be the catalyst for a full-blown crisis. We also believe that the willingness of the Bank of England to provide short-term liquidity in the event of a crisis in confidence is vital support that will allow otherwise solvent banks to survive a short-term drought in liquidity. Results from various stress tests suggest that U.K. banks should avoid capital calls on shareholders even under some of the direst scenarios, not limited to solely the impact from a no-deal Brexit. Five banks in our coverage universe have significant retail and commercial banking operations in the U.K. Our preferred exposure would be the narrow-moat global giants HSBC (HSBC) and Banco Santander (SAN), where we believe the market often discounts too great an impact from any potential Brexit-inspired crisis, given its relatively modest exposure. Narrow-moat Lloyds (LYG) would be our preferred pure-play U.K. banking name, as we believe its market-leading current account franchise provides it with a steady and cheap funding base that will benefit from higher interest rates. Our conviction is the lowest on Barclays (BCS), whose relatively greater exposure to volatile, capital-hungry investment banking remains problematic. We believe that Royal Bank of Scotland’s (RBS) government ownership and troubled history have led to certain decisions that favor public opinion over profitability and shareholder interests. Within our aerospace coverage, we believe Airbus, Rolls-Royce (RYCEY), Safran, Leonardo, and Meggitt remain the most exposed to Brexit risks. The direct impact of Brexit is already being felt at many of these companies with management teams moving to increase inventory levels in the event of delays at the U.K.-EU border. This will hit cash flows but not necessarily revenue, since we believe these buffer stocks should enable product deliveries to continue unabated. While these immediate, direct impacts are more concrete and pertinent to investors, we’d also flag some longer-term changes Brexit may bring to the U.K. commercial aerospace sector. In the event of a disorderly exit from the EU, Airbus may look to move its wing production on future aircraft out of the U.K. and either onto the Continent to one of its wholly owned aerostructure subsidiaries (Premium Aerotec or Stelia Aerospace), or, depending on Northern Ireland’s status post-Brexit, Airbus might shift wing production to Bombardier’s wing facility in Ireland, which we believe has some of the most advanced technical capabilities in the industry. Similar calculus will probably be made at other large aerospace companies like Safran. While a structurally weaker British pound could induce more companies to place future work in the U.K. over the long term, we don’t think this can offset the business uncertainty arising from a potentially messy U.K. exit from the EU. We don’t envision any immediate, material impact on defense-oriented companies in the U.K. such as BAE (BAESY) and Thales, which is based in France but has about 6,500 employees in the U.K. We do think that longer term the U.K. defense industry may be at a disadvantage when attempting to cooperate directly with EU member states (outside of the EU defense agencies) on military programs. Most Concentrated Risk Lies With Auto and Forklift Suppliers Into U.K. In our hard Brexit scenario with a U.K. recession and WTO tariffs on imports, European capital goods suppliers would bear risk directly from the tariffs and added paperwork or friction costs as well as indirectly from the slowdown in demand from end markets such as light-vehicle autos, where WTO tariffs would be especially onerous and demand highly elastic, particularly in the event of increased unemployment. While the manufacturing sector as a whole is about 10% of the U.K. economy, suppliers into these end markets would not face massive tariffs, with a range of 1%-4%. In our models, we estimate the additional costs from friction--based on the WTO tariff estimate and the company’s exposure to the U.K.--works out to be about 5-20 basis points of added group selling, general, and administrative expense. The direct costs of tariffs and friction alone are not enough to make a material difference to our fair value estimates, given that most companies in our universe have a low concentration of U.K. business with the highest at less than 10% of revenue. However, a recession would be the more meaningful driver in our hard Brexit scenario, lowering demand for cycle-sensitive capital goods such as automotive components and production tools as well as forklifts. In our coverage, the companies with the greatest exposure to a U.K. recession are forklift suppliers Kion Group and Jungheinrich, with downside risk of 9%-15% to fair values in our hard Brexit scenario. In the event of this risk of economic shock and stagflation coming to fruition, there are two reasons large-cap consumer product manufacturers are likely to be more defensive investments than retailers. First, many manufacturers possess wide economic moats. In most cases, the moat sources lie in supply chain competitive advantages, but some manufacturers still possess pricing power. The second reason we expect the multinational manufacturers to be relatively defensive in this sector is that they are much more geographically diversified than the retailers. For global players such as Unilever (UL)/(UN), Nestle (NSRGY), and Danone (DANOY), the U.K. represents 5% or less of total revenue, so the impact to valuation of an outcome of U.K. stagflation is not material. Perhaps the greatest exception to that rule is RB (RBGLY), for which the U.K. represents almost 15% of its top line. Overall, we think the food grocers we cover will have a hard time passing on food cost pressures to consumers while there would be an inevitable down-trading, which will benefit hard discounters in both the food and nonfood markets. We think Associated British Foods is well positioned due to Primark, the lowest-cost clothing retailer in the U.K., while Morrison, Sainsbury, and Tesco will face headwinds (tariff- and currency-induced food cost inflation, fierce competition from hard discounters) to the benefit of no-frills discounters. We see significantly less risk for the continental chemical companies we cover, given that the majority of their sales, production, and raw material inputs are outside the U.K. Few disclose sales to the U.K., but we estimate 4%-6% is probably the average exposure. On the tariff side, we also see lower risk for continental producers. BASF (BASFY) estimates that returning to WTO rules would cost the company EUR 40 million- 60 million annually, plus an additional one-time cost of EUR 20 million if it is obliged to reregister substances with REACH, which is the primary EU legislation governing the chemical industry. However, EUR 60 million is equivalent to only 0.01% of BASF’s total revenue. As BASF is by far the largest chemical company we cover, these costs will be more of a burden for a company of average size, but we find it unlikely that the costs will be material for any of its European peers. Alex Morozov, CFA does not own shares in any of the securities mentioned above. Find out about Morningstar's editorial policies.